Mahindra is gearing up to launch the XUV300 later this month. The carmaker has already announced that the SUV will be offered in petrol and diesel versions and four variants - W4, W6, W8 and W8 (O). 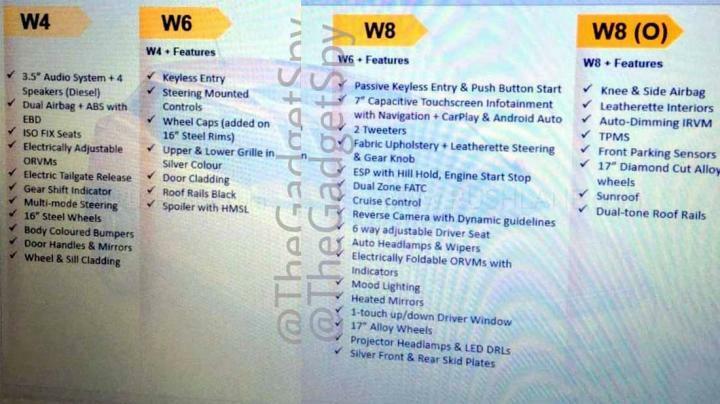 Now, a leaked image gives us a detailed look at the variant-wise feature break up of the car. According to the leaked image, the base W4 variant gets an audio system with a 3.5-inch display and 4 speakers in the diesel version. It gets electric ORVMs, electric tailgate release, gearshift indicator, multi-mode steering wheel and 16-inch steel wheels. Dual airbags, ABS with EBD and ISOFIX child safety seat anchors are standard across all variants. The W6 variant adds silver accents on the grille and air dam, keyless entry, a multi-function steering wheel, wheel caps, door cladding, roof rails and spoiler with a high-mounted stop lamp. The W8 variant gets automatic projector headlamps with LED DRLs and 17-inch alloy wheels and silver-finish front and rear skid plates. On the inside, it gets a 7-inch touchscreen infotainment system with navigation as well as Android Auto and Apple CarPlay connectivity. It has 6-way adjustable driver's seat, rain-sensing wipers, dual-zone automatic climate control, mood lighting and electrically foldable ORVMs with integrated turn signals and heated mirrors. Safety features include ESP with hill hold and reverse camera with dynamic guidelines. 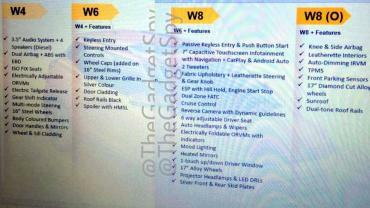 The W8 (O) variant gets all the features offered on the W8 trim. Additionally, it comes with knee and side airbags, faux leather interiors, auto-dimming IRVM, tyre pressure monitoring system, front parking sensors, 17-inch diamond-cut alloy wheels, a sunroof and dual-tone roof rails.